Bacteria and archaea have evolved adaptive immune defenses termed clustered regularly interspaced short palindromic repeats (CRISPR)/CRISPR-associated (Cas) systems that use short RNA to direct degradation of foreign nucleic acids. We have engineered the type II bacterial CRISPR system to function with custom guide RNA (gRNA) in human cells: this involves co- expression of a Cas9 protein bearing a C terminus SV40 nuclear localization signal with one or more guide RNAs (gRNAs) expressed from the human U6 polymerase III promoter. Cas9 unwinds the DNA duplex and cleaves both strands upon recognition of a target sequence by the gRNA, but only if the correct protospacer-adjacent motif (PAM) is present at the 3′ end (see Figure). We provide a collection of reagents for custom CRISPR mediated gene-targeting. A genome-wide resource of ~190k unique gRNAs targeting ~40.5% of human exons can be accessed here . To function in yeast cells, we designed Cas9 protein expression constructs using constitutive and inducible promoters as well as a gRNA expression construct using the SNR52 snoRNA promoter. We have characterized a set of orthogonal Cas9 proteins to allow multiple Cas9-mediated activities to be performed simultaneously within individual cells. Because these proteins recognize different guide RNAs, they can be independently targeted to distinct sets of sequences. 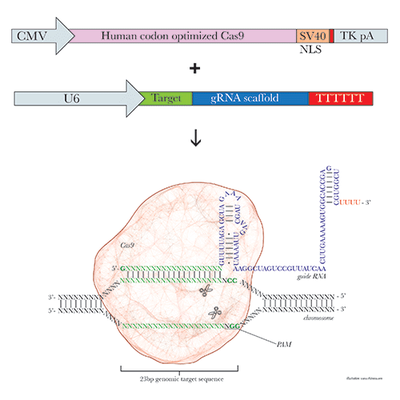 Our currently available set of Cas9 proteins includes three orthogonal variants optimized for use in human cells and four orthogonal variants usable in bacteria. Streptococcus pyogenes (SP): This is the classical Cas9 protein used in most studies to date. Neisseria meningitidis (NM): Significantly smaller than the above Cas9 protein, NM is comparably active as a nuclease and a transcriptional activator. Streptococcus thermophilus #1 (ST1): Almost as small as NM, ST1 consistently yields slightly higher activities than the others as a nuclease and as an activator, but is more restricted in the sequences it can target. SP, NM, ST1: all of these efficiently mediate cutting and repression in bacteria, with NM exhibiting slightly superior repression. Treponema denticola (TD): Larger than SP, it mediates efficient cutting and nicking in bacteria but performs poorly as a transcriptional repressor. All genes except the SP nuclease are human codon optimized but function well in E. coli . Bacteria expressing NM and TD may grow slightly more slowly than those expressing SP and ST1. just as well as the PAM determined by bioinformatics, NNNNGATT. However, it is possible that NNNNGATT will prove superior for less favorable protospacers and applications requiring particularly tight binding. In these cases it may be advisable to use the consensus sequence. See the publication for details.